Looks like you are currently in United States but have requested a page in the Vietnam site. Would you like to change to the Vietnam site? Arrogance—you think that you're right, and everyone else is wrong. Melodrama—you need to be the center of attention. Volatility—you're subject to mood swings. Excessive Caution—you're afraid to make decisions. Aloofness —you're disengaged and disconnected. 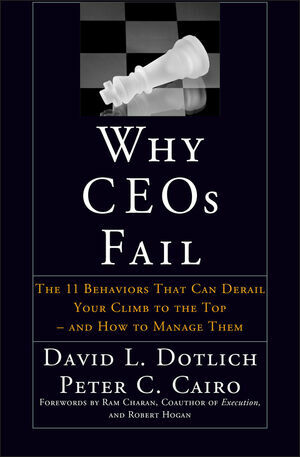 David L. Dotlich, former Executive Vice President of Honeywell International and Groupe Bull, is a partner of CDR International (www.cdr-intl.com) and coauthor of Action Learning ( Jossey Bass, l998), Action Coaching (Jossey Bass, l999), and the breakthrough best-selling book Unnatural Leadership: Going Against Intuition and Experience to Develop Ten New Leadership Instincts (Jossey-Bass, 2002). He is a business adviser, educator and coach to top executives in many global corporations. Peter C. Cairo is a partner in CDR International and member of the faculty of Columbia University Business School Executive Education. He has worked with many companies in the areas of leadership development, executive coaching, and organizational effectiveness. He is coauthor with David Dotlich of Action Coaching and Unnatural Leadership, both from Jossey-Bass.